Tours de Sport Hot Deals: Ski $$ Go Further in Canada! Banff 4 night stays from $569 per person! Ski $$ Go Further in Canada! Banff 4 night stays from $569 per person! Big Savings on 4 night stays in Banff Lake Louise when you book by February 19th! For those who love to play in the great outdoors, there's no better place than Banff, and no better place to call home after a day of adventure than the Banff Ptarmigan Inn. 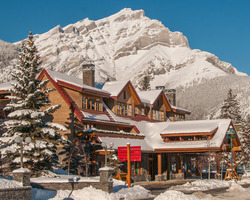 Close to downtown Banff, the Ptarmigan Inn is within walking distance of many Banff attractions including the Fairmont Banff Springs Hotel, Bow Falls, Cave & Basin National Historic Site, and the Banff Upper Hot Springs. The Banff Ptarmigan Inn boasts 134 hotel rooms. Natural wood accents add a warm glow to the hotel's interior design. Throughout, quiet corners beckon you to read in solitude, map out your next day, or simply drink in the view. There is complimentary wireless internet access in all guest rooms, as well as a heated undeground parkade with free parking (on a first come basis). Don't miss The Meatball, the Inn's on-site pizza and pasta restaurant. Hot and cold breakfast buffet every morning is included with your stay. 4 NIGHTS/3 DAYS from $569 USD person!!! Compared to $685 per person during the 2014-2015 season! Contact a Ski Vacation Specialist at 888-754-2167 to reserve your space or for additional details. You can also go directly to the Banff Lake Louise Ski Vacation page to start your custom trip quote for Banff Lake Louise. Start Planning Your Winter Vacation!!! Save 33% on 3+ night stays at Copper Mountain!